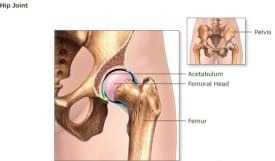 Normal Hip Anatomy (How Your Hip Isn’t Normal): You wouldn’t be on this page if your hip were normal. 14 Causes Leading To Hip Replacement Surgery? 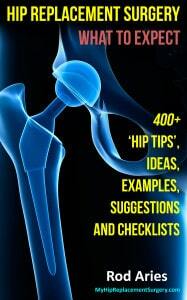 Hip Pointers – This chapter discusses how a hip should be and how your hip is different, how your hip gets worse with age, discusses osteoarthritis and list 14 causes leading to hip replacement surgery. It’s Hip To Be Hip – It is helpful to understand just how your hip is assembled. The hip joint is composed of two parts that fit together. There is the ball shaped femoral head that fits into the socket shaped acetabulum. A hard, smooth material called cartilage covers the ball and socket and allows each to slide effortlessly during any hip movements. This firm, rubbery material that covers the ends of your bones not only reduces friction in your hip joint, but provides service as a ‘shock absorber.’ Without cartilage you would have bone-on-bone grinding with every step you take. Of course if you are reading this, you already know that. Where The Rubber Meets The Road – Imagine you have a large piece of hard tire rubber (cartilage) on top of a cement floor (your hip bone) and every day you take a heavy hammer (your femur) and pound the hard rubber. Here is the full opening scene from the movie 2001: A Space Odyssey, you will be re-enacting this scene with every step you take. Yep, that was how my femur felt with every step. Yes! It Gets Worse With Age – At first you don’t see any damage to the rubber and certainly not to the cement floor. But after years and years of doing this every day, the rubber thins and ultimately you see damage to the cement floor. Over time, your cartilage will just wear out as your body does not grow new cartilage after injury or abuse. Normal cartilage can absorb impact because it is high in water content and has the ability to change shape when compressed. The more your cartilage is damaged the more pain you are likely to experience. If you are carrying excess body weight, have lifted heavy weights, ran or jogged or played years of a jumping sport (basketball, tennis, volleyball) you may have most likely accelerated the degradation of your cartilage. Just What Is Osteoarthritis? Normal activities and aging can lead to the arthritis (joint inflammation) as the cartilage between ball and socket diminishes. Osteoarthritis is the most common of the many types of arthritis. Osteoarthritis is the degradation of joint cartilage and subsequently the underlying bone. Because the cartilage no longer fully protects the ball and socket you begin to have bone on bone wear. Bone spurs are a frequent result of this condition and the spurs make the hip stiff and can lead to pain. Frequently a bony overgrowth accompanies this condition. If you are having hip pain you are most likely experiencing these irregular bone growths. As you age you are more likely to develop degenerative joint disease, also referred to as age-related arthritis. Severe muscular pain and muscular knotting. Bone-on-bone articulation (yeah, the rubbing of your bones together) right hip with sclerosis of the acetabulum and femoral head. An accident – Sometimes a hip must be replaced due to an accident from a car wreck, a fall or other trauma. Femoral head osteonecrosis – meaning that bone on bone had worn down to create blood loss to femoral neck and expose nerve endings – which I felt with each step. How A Physician Will Use A X-ray To Diagnose Your Hip – Ultimately you will have an x-ray taken of your bad hip. Once the x-ray comes back your doctor will typically show you how your hip is abnormal. Here is a video on how an arthritic hip will look on an x-ray. Surgery: When The Bill On Lifestyle Comes Due – I had 58 years of a active life including hiking, playing sports and working out before I needed surgery. In my youth, if I even knew of osteoarthritis, it seemed like a small future price to pay for my current active lifestyle. All bills ultimately come due and the surgery was the price paid for all the enjoyment I had experienced. I enjoyed everything so I can have no regrets about the hip replacement. Hip Surgery By Any Other Name – The more important and notable a subject is, the more words and slang get connected to the subject. If you have referred to your hip pain by multiple names or definitions, it is probably time to get your hip replaced. Hip replacement surgery is also referred to total hip arthroplasty, hip replacement, total hip arthroplasty, hip arthroplasty, total hip replacement (THR) and joint replacement surgery among other terms. Here Is A Hip Fact – If you need a hip replacement, regardless of the cause for your hip pain, there will be a negative impact on your life until you get surgery… and it will get worse – that is a fact. Having said that, this book will offer you several tips and suggestions to lower the total interest you pay. Alrighty… that concludes Chapter 4.